What would the currency of an independent Scotland be called? What name sums up the spirit of the new nation? Or stereotypes the nation nicely? But on a serious note (boom boom), countries need a currency that fits their economic profile which is why the Euro, tied to Germany, is no good for us. If they do float off, a flexible currency (plastic notes) is what any country needs. 'Pound' is of course a unit of mass, a physical weight, so why not the Scots gaelic for 'mass' as in weight, Màs? I'm sure the Màs would take it's place amongst the Dong, the Ringgit and the Kuna. I obviously misread the headline. I thought it was a statement. Maybe they should call it the Darien as a reminder. Fair play to the spammers. We've all got to make a living, and some of this stuff is almost poetic. "this means that this name will reflect automatically the name of the state that will be on its money"
"concerning the name of any money is very interesting to choose in a good way"
It has a terrible beauty. All of you except Mark Fogg are far too optimistic. 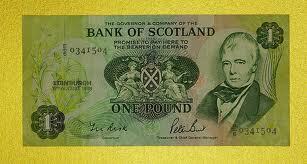 Scotland's currency will be the euro. It is after all the EU's 'legal' requirement that all new joiners must join the euro. As a newly independent country joining the EU Scotland will be caught in this net. The pebble and the sheep's tooth 'far too optomistic'. Hmmm. Given that copper wire was invented by two Scotsmen fighting over a penny, how about the "Graspit"? By the way, you need to sort your comment spam filter out - it obviously ain't working. Budgie - Croatia is not joining the Euro but is joining the EC. What Monday I get to correct Budgie! The Groat, each one being made up of 1314 mickles. I like the one about Darien. Legally of course, it has to be the Euro, an inconvenient fact which Salmond tends to overlook. No doubt he'll want to call it the Salmond - the man's ego knows no limits. Anthem I have the only filter that blogger has - I agree its sub-optimal but I normally get them within a few hours or so! There will be a 100 Kicks to the Groin. C'est vrai que chacun à l'envie de donner un nom propre pour la monnaie mais de ma part je préfère qu'il soit d'un événement très connu ou bien une personnalité connu à travers le temps par ses exploits sans oublie. CU, I was not implying that countries join the euro the instant they join the EU. Nevertheless it is a treaty requirement that EU members adopt the euro after fulfilling various criteria. nice ideas and very good """ What would the currency of an independent Scotland be called? really i find this very good and very interesting "" What would the currency of an independent Scotland be called?